During the protests and gatherings in Iran, which started on Tuesday July 31 in various cities, riot police, police, security forces and plainclothes agents beat and arrested unarmed protesters. The forces attempted to instill fear to prevent protests. During the widespread suppression, a young man identified as Reza Otadi was directly shot and killed by security forces on Friday August 3 in Gohardasht, Karaj. Shiraz: Security forces attacked protesters with tear gas. Tear gas hit a seven-year-old boy on the street. Karaj: Riot police and plainclothes agents severely beat protesters. The government used water cannons at night to disperse the crowds. Isfahan: Riot police, who had a heavy presence in the city’s main streets, attacked protesters gathered under a bridge. Riot police also attacked protesters in other areas. In Noavaran Square, security forces attempted to disperse protesters and they stood in one row in front of the people to block their path. The police used water cannons against protesters. In another area, security forces clashed with the people and after shooting tear gas, and bullets, they were able to disperse them after around 10 to 15 minutes. Rasht: Security forces and riot police severely beat protesters using batons and electric shockers (Tasers) and injured a number of people. Karaj: Riot police and other forces beat protesters. Isfahan: Riot police shot tear gas and pellet guns at protesters. Protesters responded with rocks. Riot police then used live bullets and a young protester was shot in the leg. Ahvaz: Regime agents attacked people who were standing in small groups on the street. 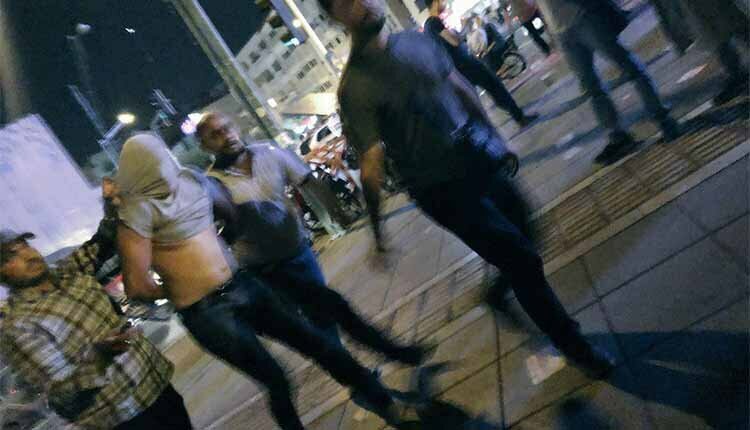 Tehran: In Valiasr Square, security forces attacked and arrested a number of protesters. Shahin Shahr, Isfahan: Bassij forces from the Revolutionary Guards Corps clashed with people and severely beat them. Shiraz: Security forces patrolled the area on motorcycles to scare people off. The security forces, who were sitting two on one motorcycle, attacked protesters. Plainclothes agents also attacked protesters while riot police shot tear gas at the gathered crowds. Undercover agents went into the crowds and detained protesters. Qahdarijan, Isfahan: Riot police clashed with protesters and shot tear gas. Karaj: Bassij forces attacked protesters on the streets. Riot police shot tear gas at protesters. At night, a large group of riot police on foot marched on the street while other police on motorcycles rode behind them to create an atmosphere of fear. Mashhad: Riot police on foot and on motorcycles shot tear gas at protesters and detained a number of people. Shahin Shahr, Isfahan: Riot police shot tear gas at protesters while police attacked the protesters with batons. Riot police on motorcycles patrolled the streets to create an atmosphere of fear. Bassij forces attacked protesters. Karaj: A large number of riot police shot tear gas and pellet guns at protesters and also attacked and beat them. Bassij forces, Revolutionary Guards Corps agents, and plainclothes agents attacked with batons. They shouted slogans in favor of the Iranian regime’s Supreme Leader while attacking protesters. A young man identified as Reza Otadi was shot and killed by security forces. Another young man was shot directly in the arm with live bullets and was taken to hospital. Tehran: In Valiasr Square, police arrested a number of men and women. There was a heavy security presence in the region with a large number of police and plainclothes agents. Police arrested those with cellphones filming the scenes. Police attacked people with Tasers and batons especially women. Bujnord, North Khorasan Province: Security forces attacked protesters and detained at least 10 people. Karaj: At night, when riot police attacked on their motorcycles, around 100 undercover agents, Bassij forces and Intelligence agents who were among the protesters with masks started arresting people. The agents pulled the protesters shirts over their heads and forced them on a bus. Qahdarijan, Isfahan: Security forces shot in the air. Eshtehard, Karaj: Security forces attacked and detained protesters who were gathered outside the Eshterhard Seminary. Tehran: Riot police attacked protesters in South Kargar Street. Riot police attacked protesters who had gathered in the area and arrested a number of people. Security forces were stationed in all the main streets and prevented any kind of gathering. Internet lines were initially slowed down until they were completely cut off at night for a few hours. Karaj: A water cannon and various kinds of armored vehicles were brought out on the streets along with at least 30 security forces on motorcycles. Close to 50 masked plainclothes agents were standing in the area. All the streets leading to Gohardasht were barricaded with cement barrier blocks. Cameras were set up in various areas to identify protesters. Security forces threatened store owners in the area around Gohardasht to close shop. Bassij forces were stationed with sticks while agents were on the scene with batons and other equipment. Plainclothes agents carried various kinds of weapons under their clothes to injure and beat protesters. Security forces severely beat protesters and detained a number of them. They shot tear gas at the crowds in short intervals. In other parts of the city, riot police and a number of tanks were also brought to the streets. The internet was slowed down to the extent that nothing could be sent out and after a while, it was completely cut off.